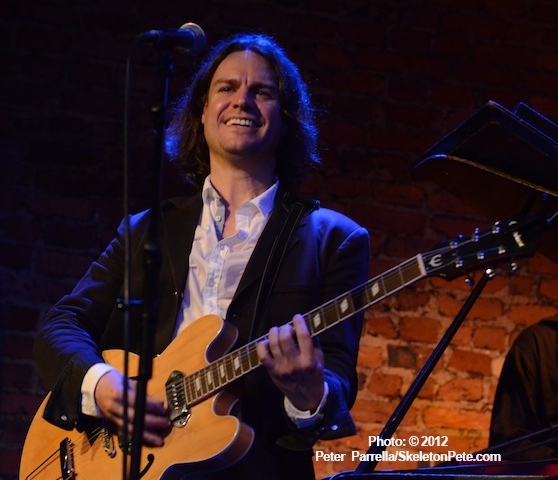 On April 29, 2012, singer – songwriter – guitarist Jann Klose wrapped up a month long stint at Rockwood Music Hall on Manhattan’s Lower East Side. Ken Pierce and I were fortunate enough to catch the capper show of the four weekend residency. Having met Jann at the Greg Lake press conference last month it was a treat to get to hear him perform. Backed by Chris Marolf on bass, Rob Mitzner on drums and Keyboardist Lars Potteiger, Klose opened the night with one of his newest recordings “Falling Tears.” The musicians took advantage of their extended set time by stretching out a bit and offering up some new songs. Klose noted that the residency was a nice opportunity to mix up the sets and audition material for the next album. He genially joked that he’d be using his “applause-o-meter” to judge the value of tunes for the forthcoming album. Based on what we heard, it will be a hard choice. Each had excellent melodies and choruses to recommend them. While reviewers have often compared Klose’s vocal delivery to that of early 60’s Paul McCartney, and I clearly hear a Billy Joel like turn of phrase in several songs, he has a wider musical world view than either of them. Born in Germany and spending part of his formative years in Kenya, Klose integrates a universal range of rhythmic motifs into his pop based songwriting. The reggae-esque “Hold Me Down” is a favorite of mine. It’s a fun upbeat tune during which the band – aided by vocalist Aisha Eustache – easily elicited an audience sing-a-long on it’s infectious chorus. With Lars switching to accordion, and augmented by Megan Marolf on oboe and Leah Potteiger on violin, the group took on a gypsy jazz feel turning Rockwood into a poppier version of The Hot Club. The band closed the night with a jazzy take on “Stormy Monday Blues” with a little Sly Stone thrown in for good measure. In addition to his solo recorded work (3 full length CD’s and 2 EP’s are available) Jann has been a member of the stage companies of Tommy on Broadway, Jeckyll & Hyde touring and Jesus Christ Superstar in Europe. For last year’s Jeff Buckley Tribute Show at Knitting Factory he joined Gary Lucas (Captain Beefheart & The Magic Band, Gods & Monsters) for an impressive rendition of Grace album opener “Mojo Pin.” Lucas returned the favor on night three of the Rockwood engagement. Jann will be opening for Yardbirds drummer Jim McCarty at Iridium Jazz Club on Wednesday May 2, 2012, that’s tonight! There are two shows and it should be quite a treat to hear him join the headliners for a few classics like “Heart Full Of Soul” and “For Your Love.” I suggest you keep an eye on his schedule for other opportunities to catch he and his band. This was really a good night of music and also a bit of a learning experience in how the venue operates. I cannot wait to tell other friends in music that this might be right up their alley so they can be as entertaining in their own adventures. I am def planning on also catching Jann again and hope he does it with a full band as well since the material sounded great like that.